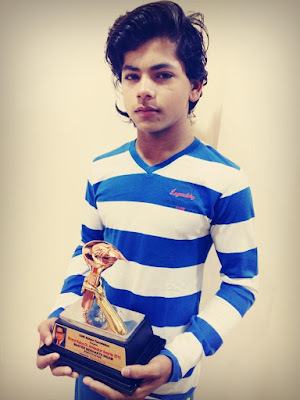 Siddharth Nigam is a talented and National level gymnast TV child artist who can be seen currently on Colors channel in historic drama show "Chakravartin Ashoka Samrat"( Young character of Samrat Ashoka ). He was also cast in a Bollywood movie "Dhoom 3" in 2014 where he played the role of young Aamir khan. He initiated his career with an advertisement for Bournvita energy drink followed by "Maha Kumbh: Ek Rahasaya, Ek Kahani". He was spotted by the director Late Mr Yash Chopra for his upcoming film "Dhoom 3" at the event of National School Games held in Pune where he was invited as a chief guest. Siddharth won a gold medal there at that time. Siddharth Nigam was born on 13 Sept 2000 in Uttar Pradesh ( India ). He lost his father at a young age and his mother has struggled a lot for Siddharth and his elder brother Abhishek Nigam. Now his mother is running an NGO and a beauty Parlor as well. Siddharth completed his schooling from Khelgaon Public School, in Allahabad Uttar Pradesh. He was passionate about Gymnastics since childhood and inspired by his mother a lot to continue this. He interviewed to media about his film Dhoom 3 that " I had no problem doing any of the scenes. The only time I had a problem was when I had to call Jackie Uncle, 'Papa'. That felt strange. Otherwise kab shuroo hua kab khatam pataa nahin chala. Bahot mazaa aaya. When I saw myself on screen, it felt like it was someone else, not me. Amitabh Uncle was there. I had never in my wildest dreams imagined I'd actually see him in personal some day". He is so....smart and cute !!! He is very talented actor. He will achieve good things in his career. So talented so cute Definitely u become a big star.